He went the extra mile. Not all superheros wear capes. When Kelly du Plessis left a meeting in the Pretoria CBD, she realized her car was missing. "It simply was not there anymore," she explains in a Facebook post. "I flagged down a police officer to tell him my car had been stolen but he said 'no ma'am, it's probably been towed! This is a diplomatic parking'. "There was no sign and no road marking due to the construction, only those concrete barriers." Her phone's battery flat, she was "helped kindly by security guards" to have it charged behind the counter of an office. "They called around for me and determined that there was a few places where my car could be." That's when Kelly hailed an Uber and "Thabang and his steed arrived." The "gentleman" charged Kelly's phone in his car, and drove her around the CBD to locate the missing car. "When they reached the pound, Thabang insisted on accompanying her inside. "He looked at me and said 'ma'am it's too dodgey here, I can't let you go in alone!"'" shares Kelly in the post, which has garnered more than 7000 reactions since it was shared on November 17. "He politely walked me into the station, spoke to the officers in their own language, and determined my car was there. "Thabang even argued my case for me and told them there was no signs etc up due to the construction etc." Afterwards, the "complete hero" made sure that Kelly was safely in her car and out of the pound before driving off. "He was an absolute gem and took away a lot of the stress and anxiety! He was my hero yesterday. Thank you Thabang. 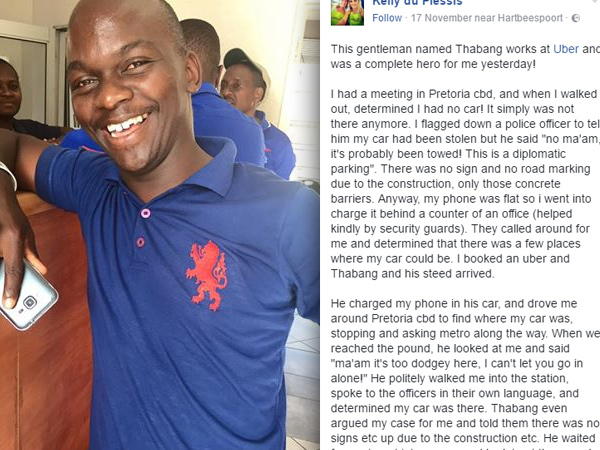 #UberHero"
Kelly's story has attracted a positive response, with many praising Thabang for going the extra mile in helping Kelly locate her car. "Wow so many good kind people in our rainbow nation.Let us not be distracted by those who dpread a negative message and continue to intercede for our beautiful country," commented Louise Beukes. "True example of unity in our country. Well done," added Jacqueline Nowakowitsch. Kelly admits she was pleasantly surprised her Facebook post went viral. "I was quite surprised at how people love to share good news," she told YOU. "It was refreshing to see all the comments and love that surrounded the post, and how it rejuvenated proud South Africans." So does Thabang know he's become a viral sensation? "Uber did tell me that they were going to show Thabang all the posts," said Kelly. "I would really like to meet up with him again, take him for a meal and find out a little bit more about him as a person. And thank him again for his kindness and care."